If we are honest with ourselves, most of us probably do not get the recommended amount of fruits, vegetables, and nutrients we need each day. Even for those of us that do achieve the necessary amounts, a multivitamin can help fill in any nutritional gaps. With countless formulas available, choosing the right one can feel daunting. 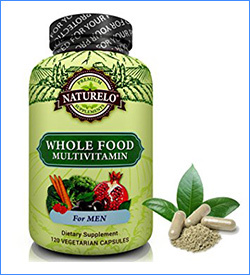 Therefore, we set out to help you find the best multivitamin supplement for your needs – including a range of options for men, women, and children. These Seeking Health capsules provide a potent combination of bioavailable nutrients, antioxidants, and more than 50 nutritional ingredients. Easy to absorb capsules allow for fast absorption of all the beneficial vitamins and minerals contained in the vegetarian formula. Extensive research went into producing the proper proportions of nutrients to prevent toxic build-up, ensure absorption, and prevent other side effects. The formula, although the most expensive on our list, is free of fillers, artificial colors, and common allergens. This product features a formula that is packed with premium, powerful ingredients and free of gluten, soy, GMOs, preservatives, and colorants. Also, a wide range of food-based antioxidants are included in the nutritious formula. Like resveratrol from grapes, lycopene from tomatoes, astaxanthin from algae, ginger root extract, and more. While it is one of the pricier options on the list, it offers a 5% discount when purchasing 2 or more products from this brand. 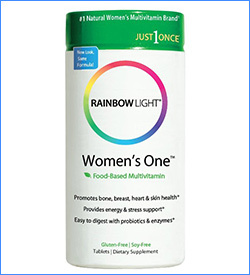 Rainbow Light’s supplement is a top-selling formula and an excellent option to consider if you are looking for the best multivitamin. The food-based formula is designed to deliver potent, pure nutrients while still being gentle on the stomach thanks to the addition of enzymes. Sugar, dairy, wheat, lactose, soy, and allergens are entirely avoided in the high-quality formula. The tablets – specifically designed to support bone, hormone, immune, skin, and breast health – earn a well-deserved spot on our best multivitamin list. If you are looking for a doctor recommended formula that is free of preservatives, colors, flavors, sugar, and artificial ingredients, DNA Formulas’ multivitamin is a great option. 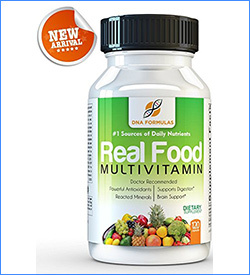 These multivitamins contain preferred forms of several vitamins and minerals – methylcobalamin instead of generic B12 (cyanocobalamin) and folate instead of synthetic “folic acid” – along with patented chelated minerals. It is also rich in Vitamin D3, a crucial component of healthy bones, strong teeth, and a stable mood. 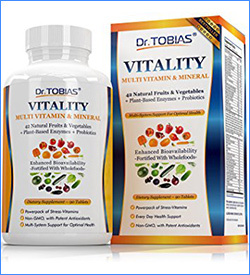 Potent antioxidants, bioavailable vitamins, plant-based enzymes, and probiotics can all be found in the multivitamins from Dr. Tobias. Therefore, customers praise the boost of energy these vitamins seem to provide. Although the formula is non-GMO, consumers looking for a soy-free multivitamin will be disappointed with these since they do contain soy. 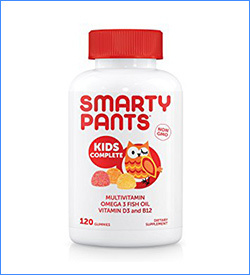 This SmartyPants Gummy Vitamins supplement is worth considering if you are searching for the best multivitamin for children. Moreover, these best-selling multivitamins contain zero synthetic colors preservatives, gluten, allergens, or artificial flavors. They also contain Omega 3s sourced from wild caught fish to help promote healthy brain development. Centrum Silver Men Multivitamin provide high levels of Vitamin D3 and health-supporting nutrients in a certified gluten free, non-GMO formula. 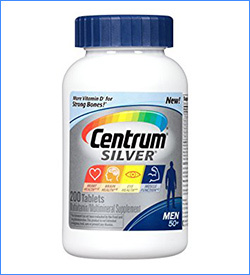 Customized for men over the age of 50, Centrum Silver provides nutrients that support muscle function in addition to brain, eye, and heart health. So, with over 2,000 reviews and a 4.7-star rating online, users clearly find these to be one of the best multivitamins on the market. 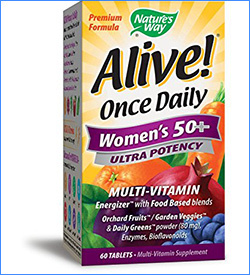 These multivitamins provide potent B vitamins, Vitamin D3, plant-based calcium, bioflavonoids, flax lignan, and other key nutrients for women over the age of 50. The formula, which calls itself the “most complete once-daily vitamin” for women over 50, boasts 26 fruits and vegetables, 22 vitamins and minerals, 12 organic mushrooms, 12 digestive enzymes, and 14 green foods. It is also manufactured without the use of synthetic flavors, preservatives, or gluten. 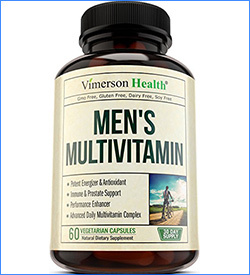 Vimerson’s self-described “powerhouse” formula claims to boost energy and stamina, support a healthy prostate, enhance the nervous and immune systems, increase antioxidant capabilities, and more. Therefore, being formulated with only the safest, most gentle ingredients, these multivitamins are free of yeast, soy, sugar, GMOs, gluten, preservatives, and diary. The company also provides a money back guarantee as a nice bonus. 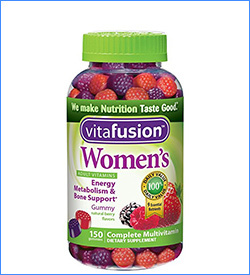 Vitafusion Women’s Gummy vitamins offer the advantage of chewing a delicious, naturally flavored gummy as an alternative to swallowing a capsule. While the tasty vitamin gummies are free of gluten, eggs, peanuts, soy, and milk. Also, happy customers report that the gummies have an excellent taste and help boost their energy levels. If you know you are falling short of nutrients or are simply seeking to boost your health, a multivitamin might be a good choice for you. 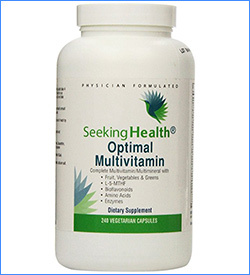 We are sure you will find our recommendations for best multivitamin helpful. Please be sure to let us know if you tried any of the formulas. Also, if you have a favorite that you think would be a good addition to our list, please leave a comment bellow!